At the end of each month I will announce the totally optional theme for the following month. For the month of April 2014, the theme will be Spring. After this winter, I think an infusion of Spring is needed, straight away! *Focus on what is sprouting in your own life, take some time to write about it in free form. *Spend some time in the dirt. Playing, digging, planting, getting messy. *Play with spring colors in your work. *Take your sketchbook outside and draw what you see. *Document signs of Spring through photographs. 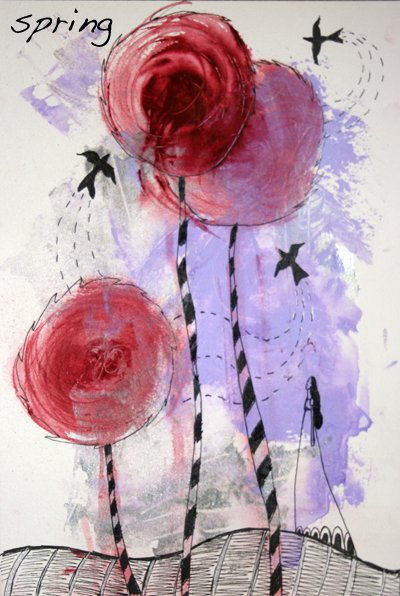 *The above piece is adapted from my painting Lollipop Trees.